This board will be a little different from the others, in that there will be one topic for each of the backcountry sites within the park. Members will be able to add reviews, descriptions, pictures, opinions, etc. for any given site, which will then be available for easy reference. If I miss any sites, let me know. Obligatory Disclaimer: This information may or not be based upon the latest available data. If the NPS would post current information, I wouldn't have to go digging for it in the old Compendium and in internet archives. That's my story, and I'm sticking to it. Caveat lector. 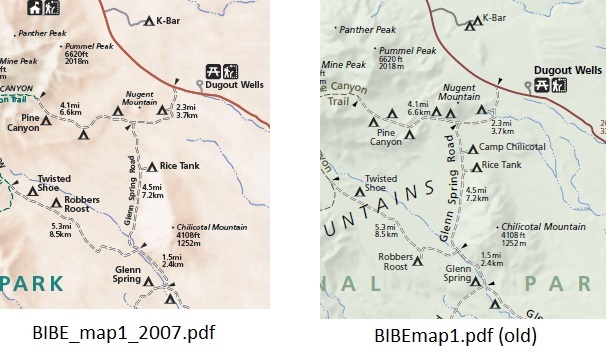 Has anyone compiled a roadside campsite or RGV review similar to the Chisos Basin list? Not that I know of. Looks like you just volunteered. I've been thinking about this for some time. One simple idea that I've had is to create a new area of the forum for backcountry campsites. Within that create one topic for each campsite and lock the area to new topics. Each of us could then post replies with pictures or reviews. Last spring I took pictures of many of the campsites along Old Ore and other places that I've been waiting for the right time to offer up. It would be a good single location on campsites and by locking the area to one thread per campsite would make it easy to find the information. Of course, since the NPS currently does not provide that information on their website, the limits may very well have changed. Unless Eric moves back to the park and takes over the Webmaster position, it looks like the only way you'll get any definitive answers is to contact the park. Good luck. * Both sites in these areas may be combined to form one group site with a 3 vehicle/20 person limit. NM #1 and #2 as a group site will accommodate 4 horses 4-trailer pulled by 4x4 vehicle only. Disclaimer: this information is only valid as of 2010 and may change without notice. I'll start with the primitive roadside campsites, then add the High Chisos campsites as time permits. Ok, folks. Have at it! I'll add the Chisos sites some time later. If I had more free time, I'd go through the archived site mentioned above and copy & paste in descriptions for each site. Great concept, Richard. I'll get to work on a few of the ones I've visited. Some of the sites on your list don't exist anymore. For example, Talley 3 and 4 were wiped out in the '08 flood, and I don't know if they have ever been rebuilt. Thank KevinT for the idea. Good to know. Maybe someday the NPS will get around to updating their online documentation and website. Following the 2008 flood, several sites were closed as noted above. I'll leave the topics for them as-is for historical purposes and in case they are ever reopened. Great idear by Kevinnt! Thanks for implementing it so quickly Richard! I will definitely be referring to this in the future. Great job, Richard!! I've bookmarked it. Pretty unlikely they will ever reopen but leaving them up for historical purposes is good. I went to a ranger talk last week - she opened it up for random questions while waiting to start, and one question was if the park was considering opening another campground. In the course of answering that question (No, they aren't), she mentioned they have added several new primitive sites to replaced the flooded ones, and said that the park is going the route of placing new primitive sites in higher/drier areas rather than spending time/money to reopen sites that are known to flood.